Welcome to The Abso!ute Sound online! We explore music and the reproduction of music in the home. We believe that the sound of music, unamplified, occurring in a real space is a philosophic absolute against which we may judge the performance of devices designed to reproduce music. Our goal is to provide the resources consumers need to judge how a component's sound either honors or departs from the music's truth, and to make sound purchasing decisions that maximize their experience of reproduced sound. Below is our Issue 249, January 2015 table of contents and editorial. Harry Pearson, the founder of TAS, has passed away. Jonathan Valin writes a heartfelt tribute, and Andrew Quint remembers what it was like to listen to music with HP. 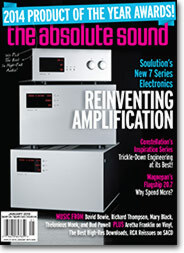 Alan Taffel goes to the New York Audio Show; Robert Harley reports on the return of Audio Alchemy; Neil Gader previews DALI's new speaker line; and Spencer Holbert reviews the book Vinyl Lives On. Which makes a better music server—Mac or Windows? In Part Three of this groundbreaking work, Charles Zeilig, Ph.D., and Jay Clawson employ their newly developed method for assessing sound quality to answer that burning question. This is the big one! We name the most outstanding products of 2014 in these, our most prestigious awards. Wayne Garcia calls on his 30 years of experience with Rega 'tables to evaluate the legendary British manufacturer's latest, most ambitious effort. Longtime audio writer Greg Weaver makes his TAS debut with an insightful assessment of this ambitious phonostage from Esoteric. Robert Harley on a new Inspiration line that brings the identical circuits from Constellation's ultra-expensive electronics to a more accessible price. Paul Seydor swoons over this highly unusual DSP'd open-baffle loudspeaker. Jacob Heilbrunn listens to excellent new tube electronics from Deutschland. The Maggie 20.7 poses the question: "Why spend $100k on loudspeakers?" Don Saltzman returns to TAS by asking the same question. Audience makes the case that when it comes to cables, thinner is better. Jacob Heilbrunn puts that theory to the test. The company known for building mega-priced equipment racks brings its technology down to earth in these beautiful—and beautiful sounding—new products. Robert Harley is shocked to discover the sonic benefits of Critical Mass' state-of-the-art amplifier platforms. Anthony H. Cordesman listens to the Colorado company's top-end electronics. Never before has sheer beauty of timbre been combined with such startling dynamics and bass solidity. Jonathan Valin and Robert Harley weigh-in on what may very well be the world's best solid-state electronics—no matter what your definition of "best." Jeff Wilson's survey of contemporary jazz singers includes lesser known and emerging vocalists. Arthur Lintgen waited patiently for these reissues—and likes what he hears. New music by Richard Thompson, Laetitia Sadier, Hot Rize, the Roys, and Joan Shelley, reissues by David Bowie, Big Star, They Might Be Giants, and Mary Black, plus Aretha Franklin and Peter, Paul & Mary on vinyl. Violinist Rachel Podger, flautist Mihi Kim, the Los Angeles Percussion Quartet, and the music of Poulenc and Papandopulo. New releases by Wadada Leo Smith, Ron Miles, and Medeski, Scofield, Martin & Wood, plus reissues by Thelonious Monk and Bud Powell. 224 We talk to Peter McGrath, recording engineer extraordinaire.